Oh man, what can I say about this mini that the mini itself doesn't already say. This model is fantastic! It's the perfect blend of old school 2nd edition looks with modern aesthetics. 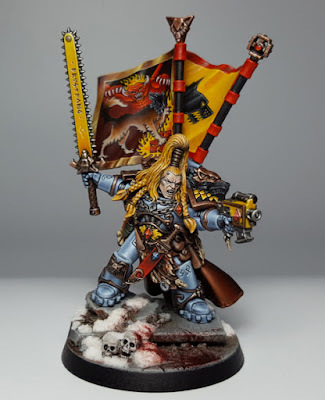 Ragnar has always been one of my favorite characters in 40k, it probably has something to do with the William King novels which were some of the first books I read in the setting. The conversion work on this is pretty flawless. The main body looks to be from Krom Dragongaze, which has always had some great Ragnar potential in it. The rest of the mini though is all converted, and is spot on accurate to the current Ragnar mini from the wolf head on the shoulder pad, to the weird rivet things around his feet. Once you move onto the paint job this mini just continues to amaze. 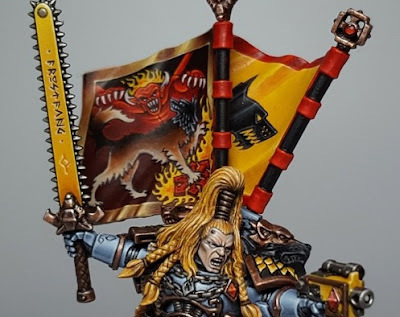 It's like an old 2nd edition codex cover come to life. I love the bright yellows and reds, a trademark of that time period. Perhaps the old schooliest thing about him though is his blonde hair. All of the painting itself is sharp and smooth and absolutely top quality. I really don't have anything bad to say about this guy, fantastic conversion, fantastic paint job, fantastic amount of nostalgia, fantastic model all around.